SEO and content marketing have a lot in common with the flywheel effect. Like a water wheel, these marketing strategies require a significant amount of effort to start moving and are slow at first, but take on a life of their own after they’ve gained enough inertia. 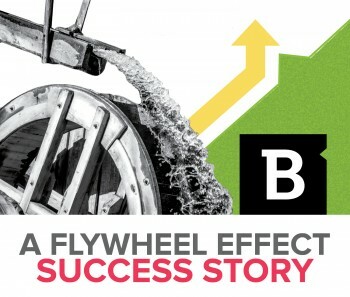 This is what most companies see when they start content marketing strategies, and the results one Brafton client saw three months into its campaign exemplifies the ‘flywheel effect.’ Over the course of a business quarter, the site built a search-optimized content archive and saw organic traffic increase 61 percent. A lot of decision makers are skeptical about content marketing and SEO because even the best strategies take time to show results. From a business standpoint, this is a reasonable concern – if you invest, you want a tangible return … soon. But think about it from a search standpoint. Imagine there was a switch companies could flip and automatically outrank other sites. Search engines probably wouldn’t deliver the most reliable results, and the ROI would be minimal because every company would use the same trick to rank No. 1. When brands invest in content marketing and SEO, they’re putting effort toward strategies that will build momentum over time and drive results in the long run. Websites with relevant blog content and downloadable assets send Google and consumers a message that says, “We have the information you’re looking for about this topic.” Search engines start to serve the result more often in results pages, and people will see the content more often, share it and link to it, which boosts the ranking even higher. This is what the client saw: There was some initial movement with traffic once the strategy was put in place as the target audience discovered the site was a valuable resource of home electronics information. But those first changes turned into a major incline as the strategy gained traction, even though the client wasn’t publishing any more than it was at the start. By the end of the third month, it was getting 55 percent more visitors and organic pageviews had increased 37 percent. Additional search traffic was one of the client’s primary goals, but it was just the start. At the end of a quarter during which the company was publishing content optimized for search results, the client also saw that visitors were spending more time on the site (viewing blog pages, specifically) and that many readers were going on to complete goals, like ordering products. It became clear that the initial investment in custom content was building momentum and generating more results, even though the company was putting in the same amount of resource.